Opposite the airport terminal are the city buses and intercity buses. The airport bus has a service between El Prat airport and Plaza de Catalunya. The buses depart from both Terminal 1 (T1) and Terminal 2 (T2). In peak times the airport buses depart every 5 minutes. A single ticket cost €5,90 and the journey takes 35 minutes. Airport terminal 1 or Airport terminal 2, Plaza Espanya, Gran Via – Urgell, Plaça Universitat, Plaza de Catalunya. Plaza de Catalunya, Sepulveda – Urgell, Plaza Espanya, Airport terminal 1 or Airport terminal 2. An official taxi from the airport to downtown takes 20-25 minutes and cost about €25-€30. It depends of your destination. The airport is 13 km in south of the city. The area of railway station Sants is relative nearby the airport. More distant is the area of the Sagrada Familia. This is the pricelist of the airport taxi’s. The airport train is a local train that run every 30 minutes. The airport railway station is 10 minutes walking from Terminal 2B. A free airport shuttle bus leaves from Terminal 1 to the train station. It takes 19 minutes with the local train from the airport to Central Station Sants and 26 minutes to to Passeig de Gràcia. This is the schedule of trains from the airport. A single ticket cost €4. If you buy 10 rides (T-10 travelcard) the price is €10. The T-10 Travelcard can also be used for trains, buses, metro and tramways in Barcelona city center. Ryanair has flights to El Prat Airport from airports in 14 countries including London Stansted, Berlin Schonefeld, Paris Beauvais and Rome Fiumicino. 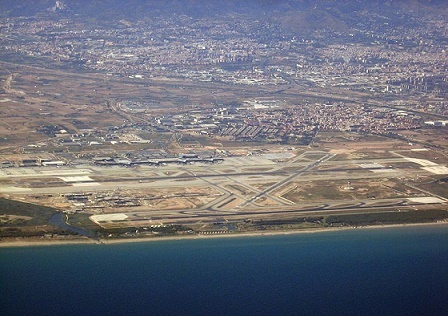 If your hometown is not near an airport flying to El Prat then the airport in Grona or Reus is maybe an alternative. With the shuttlebus it’s 1-1,5 hour from Girona to Barcelona. A single bus ticket is €11.